Catch Iggy on tour in support of his 1977 album Lust for Life with a band featuring Bowie on keyboards. By 1977, Iggy Pop was in trouble. His pioneering proto-punk band, The Stooges, had collapsed, and he was sinking ever deeper into heroin addiction and mental illness. That’s when his friend David Bowie (no stranger to debilitating drug problems himself) stepped in. The two relocated to Berlin, and with Bowie behind the boards, Pop released two seminal solo albums in 1977, The Idiot and Lust for Life. 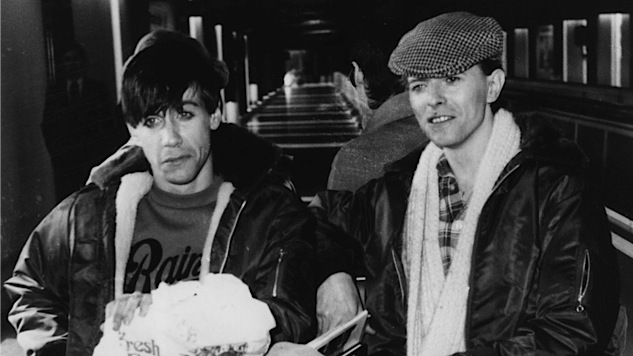 The pair turned out to be a crackling songwriting team, penning tracks like “China Girl” and “Sister Midnight.” Pop signed a new record deal and Bowie joined him on tour. This performance, recorded March 21, 1977, at Cleveland’s Agora Ballroom during Pop’s Lust for Life Tour, features an all-star backing band including Bowie on keyboards and backing vocals, Tony and Hunt Sales (sons of Soupy) of the Todd Rundgren band, and Pop’s former Stooges bandmate, Scott Thurston. The recording includes a chunk of Pop’s classics from his Iggy and The Stooges days, including such memorable anthems as “1969,” “Gimme Danger,” “No Fun,” “Search and Destroy” and the unforgettable “I Wanna Be Your Dog.” For any Iggy Pop or early punk fan, this a definite must-hear. Listen to Pop perform Stooges hits “Raw Power” and “I Wanna Be Your Dog,” plus The Idiot track “Funtime” at his performance in Cleveland on this date in 1977.